Robert Gordon’s “The Rise and Fall of American Growth” argues that an unprecedented and unrepeatable “special century” of life-changing inventions has produced unrealistic expectations, so the future will disappoint: “The economic revolution of 1870 to 1970 was unique . In many ways, the world of 1870 was more medieval than modern. Three necessities — food, clothing, shelter — absorbed almost all consumer spending. No household was wired for electricity. Flickering light came from candles and whale oil, manufacturing power from steam engines, water wheels and horses. Urban horses, alive and dead, complicated urban sanitation. Window screens were rare, so insects commuted to and fro between animal and human waste outdoors and the dinner table. But on Oct. 10, 1879, Thomas Edison found a cotton filament for the incandescent light bulb. Less than 12 weeks later in Germany, Karl Benz demonstrated the first workable internal combustion engine. In the 1880s, refrigerated rail cars began to banish “spring sickness,” a result of winters without green vegetables. Adult stature increased as mechanical refrigeration and Clarence Birdseye’s Birds Eye frozen foods improved nutrition. By 1940, households were networked — electrified, with clean water flowing in and waste flowing out, radio flowing in and telephonic communications flowing both ways. Today’s dwellings, Gordon says, are much more like those of 1940 than 1940 dwellings were like those of 1900. No more lack of privacy for people living and bathing in the kitchen, the only room that was warm year-round. Since 1940, however, only air conditioning, television and the Internet have dramatically changed everyday life, and these combined have not remotely matched the impact of pre-1940 changes. Nineteenth-century medicine mostly made patients as comfortable as possible until nature healed or killed them. In 1878, yellow fever killed 10 percent of the Memphis population. But 20th-century medicine moved quickly from the conquest of infectious diseases (the cause of 37 percent of deaths in 1900; 2 percent in 2009) to the management of chronic ailments of the elderly. There were 8,000 registered automobiles in 1900 but 26.8 million in 1930. Ford’s Model T, introduced in 1908 at $950, sold in 1923 for $269. Gordon says two calamities — the Depression and World War II — fueled the postwar boom: The Depression by speeding unionization (hence rising real wages and declining work hours), the war by high-pressure “productivity-enhancing learning” that, for example, manufactured a bomber an hour at Michigan’s Willow Run plant. Mr. Gordon seems to spreading around a lot of highly educated doom and gloom and lot of people seem to be taking it seriously. Is he seeing something real or is he being misled by charts and graphs. The new data cover multi-factor productivity – i.e., how much output the economy generates from using a wide range of inputs, including labor, capital, energy, and materials. Unfortunately, these statistics are not released in as timely a manner as those that simply measure labor productivity, and so the new numbers only present the final results for 2014. But since the economy didn’t exactly take off growth-wise in 2015, there’s no reason to believe that upcoming numbers will change this discouraging story greatly. Labor’s new release isn’t devoid of good news. The final multi-factor productivity gain for 2014 – 0.7 percent for private non-farm businesses – was much better than 2013’s performance (when it shrank by 0.1 percent). The newest increase was also bigger than the annual 0.4 percent average for the 2007 to 2014 period. But the final 2014 figure represented a slight downgrade from the previously reported improvement of 0.8 percent, and the final 2013 number was revised from a 0.9 percent gain to that small decrease. Moreover, multi-factor productivity’s 2014 growth was less than half the rate achieved between 1995 and 2014, and even lower than the 1987-2014 annual average rate of one percent. 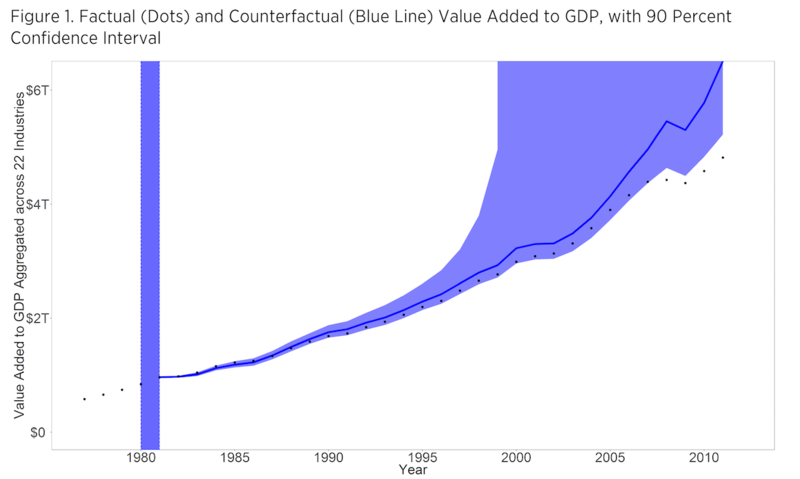 Also disturbing about the new multi-factor productivity release: For all the excitement generated by the internet revolution, social media, and the like, technological advance seems to be playing an ever smaller role in what productivity gains the U.S. economy is recording. Indeed, the “capital intensivity” of America’s private non-farm businesses fell in 2014, and has now slipped for three of the last four years. These have been the only annual decreases over the entire 1987-2014 period during which the Labor Department has tracked multi-factor productivity. Glenn Reynolds points to the problem. In the United States, which drove most of the “golden quarter’s” progress, 1970 marks what scholars of administrative law (like me) call the “regulatory explosion.” Although government expanded a lot during the New Deal under FDR, it wasn’t until 1970, under Richard Nixon, that we saw an explosion of new-type regulations that directly burdened people and progress: The Clean Air Act, the Clean Water Act, National Environmental Policy Act, the founding of Occupation Safety and Health Administration, the creation of the Environmental Protection Agency, etc. — all things that would have made the most hard-boiled New Dealer blanch. The hard fact is that innovation and technology don’t happen by themselves in a vacuum. Growth happens because entrepreneurs can exploit new opportunities. That means that resources will flow to where they can move the fastest. The reason that status quo technologies seem to stop innovating is that they get tied down by effects of legal and economic burdens placed on them because at the time nobody realized what the effect of what they were doing would be. This Ted Talk explains some of it. You can actually see the transition Mr. Brynjolfsson is talking about in the this video about rice mills in Thailand. Here the steam and electric mills are very much the same. This post points out that there is no great technology stoppage. That’s generally true. what happens is that as the burden of government and rent seeking grows , capital for innovation and business growth becomes more expensive. Which forces innovation into lower and lower capital lines of technology. Which is why we now see so many apps and social sites and not so many big general technologies. In order to understand how technologies advance the first thing to understand is that a technology doesn’t advance on it’s own. A technology advances in accordance to the needs of the people using the tech and the added cost of future innovation. A technology cannot grow, or for that matter even exist without all the social and cultural framework that goes with it. All too often when government decides to subsidize technologies they tend to support improvements in existing technologies. For instance the case below where the government of Argentina subsidized the construction of a super steam locomotive that was more efficient than any other. This locomotive was a wonder in fuel efficiency and a nightmare to the shop crews. It was also the last gasp of a technology that had reached the end of it’s life. This locomotive was the result of a lot of inventive innovation. It was also completely pointless. Likewise, the elites are tackling the wrong problem, using ideas and assumptions from the last century in an economy that is going in a completely different direction. The blue model has failed and it’s time we admitted it. To see what I mean, let’s look at something that elites consistently fail to talk about in any meaningful way: good jobs. Oh, we talk around those things. We talk about trade and immigration, if forced, though we do not of course do any listening on the same topic. We talk about inequality, and paid leave. We talk about education. Politicians make ritual obeisances toward the necessity of decent work, promising that some policy, laughably inadequate to the task, will provide thousands of good jobs doing something we want to do for completely different reasons, like reducing carbon emissions. But neither party has any meaningful policy to foster good work — by which I mean work that offers opportunity, stability, respect and enough money to raise a family. The closest either party comes is the $15-an-hour minimum wage, a policy with the slight drawback that it may throw a lot of people out of work. Instead of asking how we have ended up with an economy that offers stability and reward only to the holders of a college diploma, and how we might change that, elites of both parties focus on the things they want for themselves. Republicans offer tax cuts and deregulation, as if everyone in America were going to become an entrepreneur. Democrats offer free college tuition and paid maternity leave, as if these things were a great benefit to people who don’t have the ability, preparation or inclination to sit through four years of college, and as a result, can’t find a decent job from which to take their leave. While there are a lot of things on the parties’ agendas that primarily benefit the educated, there are very few that primarily benefit people who aren’t like us. The implicit assumption of elites in both parties is that the solution for the rest of the country is to become more like us, either through education or entrepreneurship. Rarely does anyone discuss how we might build an economy that works for people who aren’t like us and don’t want to turn into us. And the giant hole at the center of this discussion we aren’t having is work. We talk a lot about how to palliate the effects of a labor market that no longer offers many rewards to the less educated. We act as if jobs inevitably grow, like weeds, in the fertile soil of capitalism. Or worse, as if they were a sort of optional intermediary step in the important business of distributing money and fringe benefits. Given how central work is to the lives of the elite, how fearful we are of losing our own careers, this belief is somewhat inexplicable. It’s also politically suicidal, as the current moment now shows us. People have been pondering the rise of Bernie Sanders and Donald Trump, wondering why people are suddenly so exercised by populism at a moment when employment is all right, incomes are not plummeting, China is faltering, and Mexican immigration is flowing south across the border rather than north. The simple answer is that people don’t worry about statistics. They worry about their own lives, and especially, they worry about work. Even if they are still consuming the same amount of stuff, even if their incomes are all right for the moment, if people feel that they cannot count on work, then they will feel helpless and frightened, and they will turn to politicians who can assuage those fears by pointing to specific enemies who can be vanquished to secure their safety. Democrats convinced that they have the answer to populism in the form of more social welfare programs are as gravely mistaken as the Republicans who focused on the same old pro-business program while the populist revolution was rising in their own party. Populist movements do not arise because people are desperately worried about inadequate tuition subsidies. They arise because people are worried about their physical security and their ability to make a decent life for themselves. And “for themselves” is the important phrase in that sentence. Of course it is true that no man is an island; anything you have beyond what you could wring out of the land with your own hands without benefit of modern tools is as much a product of the society around you as it is of your own efforts. But that does not mean that most people will be content to be the well-fed wards of that society, or for that matter, to be the wardens. Most people want to be in a reciprocal relationship with the society around them, providing valued labor in return for valued goods and services. Giving them the goods and services without the work is as unsatisfying as giving someone an Olympic gold medal for a sport they’ve never competed in. There is no better example of the folly of the elites than the current fashion for a universal basic income among both liberals and libertarians. Instead of trying to figure out something hard, like how to build an economy that provides adequate work for everyone, the idea is to do something easy, like give them checks. I’ve argued about the technical aspects of this before — how much it would cost, what it would mean for immigration policy, how difficult it would actually be to replace many of the welfare programs that are supposed to be cut to pay for it with a straight-out cash transfer. Leave those aside. The idea that a universal basic income can substitute for a job is exactly the sort of thing that makes sense to an educated elite that already has a lot of other sources of status and reward in our society. I’ve sat on a lot of panels on this topic, and inevitably someone waxes lyrical about the creative possibilities that will be unleashed by a universal basic income, the opportunities for art, community service, political activism, cultivation of family and friends. This is, needless to say, completely divorced from the actual experience of communities with high rates of long-term dependence, whether they are American communities where Social Security disability has become a substitute for long-gone industrial work, or European countries with a long-term dole. Being out of work makes people unhappy and depressed, even when they have an income stream to take care of their basic needs. What those unhappy depressed people mostly increase when they are out of work is their sleeping and television-watching; during the great recession, volunteering, education and exercise basically didn’t budge. But how many of today’s mandarin class are actually intimately familiar with those types of communities? Very few, so instead they imagine the only dependent community they are familiar with: a college dormitory. I will give the universal basic income people this much; even if they aren’t really grappling with the need for work, at least they understand that there is a problem in the labor markets. That’s more than you’d gather from the major speeches or the policy programs of our two main political parties. If the elites want to sell market liberalism, and immigration, and all the rest of the package, then the first thing they have to do is stop talking to each other about these things, and start thinking about how to listen and talk to everyone else. The problem isn’t innovation. There’s a lot of that going on in various places and progressive companies like Corning Glass. The habits of a century or so don’t change very fast. Still, the returns on the investment for capital have to be huge in order to justify making the investment in the first place. let’s look at it this way. a company makes a $1,000,000 over two years with an expected rate of return of 10%. Not bad, but there’s more. First there’s the city tax on that 100k, say 5.7% taking 5700 and leaving 94,300, then the state with another 5% leaving 89,300 and the federal business tax of 35% taking 35,000, leaving 54,300 or just over a 5% ROI. That’s not including any income taxes on dividends. The high taxes means that every investment HAS to have an ROI of 20% or more or the business case just can’t be justified. I’ve been there and seen the kinds of distortions this creates. It’s far easier to pay the premium by acquiring a startup that already has accepted the risk and demonstrated at least the potential for profitability than it is to take the risk yourself. The Fed regulations and money manipulations have displaced an open market of IPOs by an exclusive game of horse trading among “qualified investors” who get rich and leave Main Street out, and fail to create new jobs. And Wall Street? The once powerful engine of capitalism has been nationalized by the Obama bureaucracies feeding on fines and fees. We’ve had a covert socialist coup in Washington and it must be reversed or the free enterprise engine of growth and opportunity is in jeopardy. The Fed began as a necessary “lender of last resort” during financial crises. But today, the Fed regulates the entire financial sector, from hedge funds to pawn shops. It issues and values the money by manipulating interest rates and manipulating money. Today the Fed serves the Washington bureaucracy and a few banks that are growing bigger. Through these banks, it effectively can regulate the entire economy. What we are doing now is having money’s value determined by international currency trading. Ten banks control 77 percent of all currency trading. When currency value is more varied and volatile than the economic activity that it measures, the horizons of economic activity shrink until today the famous “flash boys” trade by the second rather than investing for the future. The problem is not that innovation and invention has stopped. The problem is that innovation cannot grow into a stand alone business. Up until the 1970’s it was possible for an innovative company to grow into a large business. Apple’s corporate history is a case in point. The fact that there is an Apple Ipod and I phone rather than an Ipod and IPhone companies is telling. Unlike China, the upfront costs for creating a new phone company are so large that there is no way a starting entrepreneur with an idea can enter the market. Contrast that with what’s going on in Shenzhen. Innovation works best when you don’t have waste time and effort asking for permission to try to do things that don’t even exist yet. The state of the creative mind is flowing through an idea, trying different things and having them fail and trying something else. That flow works best when it is not interrupted by government and company bureaucracies asking about stuff that the innovator has no possible clue about yet. Innovating, requires a leap of faith, something bureaucracies have real problem with. That’s why innovation happens most where the required constant asking for permission is low. Permissionless innovation was the secret sauce that fueled the explosive growth of these services and companies. That’s why America’s information technology companies — Apple, Google, Facebook, Amazon, Microsoft, eBay, etc. — are now household names around the globe. But we’re not done! Exciting new technologies are poised for potentially explosive growth, including: driverless cars, consumer drones, robotics, 3D printers, virtual reality, wearable tech and smart homes. These technologies offer many life-enriching — even life-saving — possibilities. Driverless cars, for example, could significantly reduce the staggering death toll on our nation’s roads. 3D-printed prosthetics and wearable fitness or medical devices could lead to massive health care improvements at greatly reduced cost. And smart home technology could improve energy efficiency while saving us money. The question, however, is whether policymakers are ready to once again embrace permissionless innovation for these sectors to unleash their full potential. Unfortunately, many of these technologies are threatened either by archaic regulatory regimes or entirely new mandates, usually proposed in the name of protecting privacy, safety, security or old business models. Innovators who make driverless cars, commercial drones and smart medical devices, for example, face mountains of pre-existing regulatory red tape imposed by bureaucracies such as the National Highway Traffic Safety Administration, Federal Aviation Administration and Food and Drug Administration, respectively. After the FDA recently ordered 23andMe to stop marketing its at-home $99 genetic analysis kit to Americans, U.K. policymakers opened their doors to the company and its innovations. Meanwhile, foot-dragging by the FAA and NHTSA on drones and driverless cars has led some innovators to set up their testing facilities overseas instead of in the United States. The constant stream of regulation is the worst thing you can do if you want more innovation and especially if you want any economic growth. The great irony of the people who support the Blue model is that in their compulsion for absolute control over everything they work so hard to strangle the very thing that the blue model needs to survive. The welfare state requires growth to pay for itself because it is so expensive and require so much debt. Yet time and again the elites in charge of welfare states work to stifle the work and innovation that is required to make the whole thing work. Federal regulations have accumulated over many decades, piling up over time. When regulators add more rules to the pile, analysts often consider the likely benefits and compliance costs of the additional rules. But regulations have a greater effect on the economy than analysis of a single rule in isolation can convey. The buildup of regulations over time leads to duplicative, obsolete, conflicting, and even contradictory rules, and the multiplicity of regulatory constraints complicates and distorts the decision-making processes of firms operating in the economy. Firms respond to both individual regulations and regulatory accumulation by altering their plans for research and development, for expansion, and for updating equipment and processes. Because of the important role innovation and productivity growth play in an economy, these distortions have consequences for the growth of the economy in the long run. This means that in 2012, the economy was $4 trillion smaller than it would have been in the absence of regulatory growth since 1980. This amounts to a loss of approximately $13,000 per capita, a significant amount of money for most American workers. The study uses a panel of 22 industries observed annually between 1977 and 2012. The authors combine data from the Bureau of Economic Analysis and the Census Bureau to measure these industries, with novel metrics of regulation by industry provided by RegData 2.2, a comprehensive, text-based quantification of industry-specific regulations in the Code of Federal Regulations. While some studies look at only one data series (such as the total quantity of regulations in the country) or attempt to compare different countries, this study’s use of 22 industries and the regulations affecting each industry provides a richer and more complete understanding of regulation’s effect on economic growth. Endogenous growth theory builds on the idea that economic growth is primarily dependent on decisions made by actors in the economy—firms and individuals—rather than on external factors. Economic growth is dependent on investment. Economic growth in a particular industry is determined by investment in knowledge creation, such as research and development, and the way that such investment leads to innovation and increases in productivity. This means that regulatory interventions that affect investment choices have a greater effect on the economy than the simple sum of static costs associated with regulatory compliance. Regulations have cumulative effects. A key insight of endogenous growth models in general is that the effect of government intervention on economic growth is not simply the sum of static costs associated with individual interventions—there are dynamic implications. The accumulation of regulation over time leads to greater and greater distortion of investment choices. Moreover, the investment choices of previous years affect growth in future years because knowledge that is not created cannot be implemented next year and the years after to be more productive. The damage done by regulation is both time and money. Time spent on regulatory compliance is time not spent on product development. Money spent on corporate bureaucrats and lawyers is money not spent on products that are never created. In time a company has so much overhead that it can no longer maintain a viable R&D system and what product development it does do is just slight improvements on existing products. Which is frustrating and depressing to the people in those companies who would like to be innovative and creative. Peter Thiel and George debate the issues here, but they miss the elephant in the room. We can talk about possibilities all we want, but if we ignore the environment those possibilities will remain possibilities. The reason that innovation happened so quickly up until the 1970’s was that the carrying costs due to taxation and regulation were so much lower. While Gilder is familiar with the supply side economics in the late 1970’s, I’m not sure that he knows that most of the ideas of supply side economics were tried by Andrew Mellon and Calvin Coolidge in the 1920’s and that they worked. Mellon actually wrote a book about how they worked. The paradox of welfare states is that regardless of how hard they try to redistribute income, not one creates prosperity through that redistribution for the recipients. For all the promises of utopia no welfare state, from the Soviet Union to Sweden has actually create the promised prosperity. All they manage are high taxes and debt. What does it say about the tax and regulatory burdens that capital is essentially free and STILL the only startups are frivolities and luxuries with a high rate of return and low risk? All the stimulus that the FED has dumped into the economy for the last sixteen years has created no growth. Instead, what has happened is an economy that grows ever more dysfunctional. The high taxes and regulations have salted the growth fields of most entrepreneurship. The fact is that in previous decades, innovation flourished because the ground for it was so much more fertile. Capital was not strangled by taxation and high inflation and there were no regulatory restrictions to deal with. The entrepreneurs of new technologies could grow their new industries almost unhampered by the heavy hand of government. Even in the 1930’s innovation had a far easier time than established industries. Which gave things like radio and television. Since the 1960’s that’s all changed. The big growth industry year over year has been the administrative state with all the rents that it collects to feed itself. Of course the growth industries of regulation and finance have also created an brain drain from the more technical fields, especially outside programming and computers. In my lifetime the big money makers have always been a career in Wall St. Invention and innovation have had a far harder time of it. The wheel seems to be turning though. Wall St. is floundering and becoming more a casino where big financial innovations are things like high speed trading where rents are sucked up in the time between the sales order and the actual sale draining off little tiny bits of profit from that gap. Nobody’s making big money from financing actual companies anymore. Yet the businesses are being started and in surprising places. There is innovation going on, but it’s more or less under the radar. Or it least it has been. If you want to know where the innovation is going on right now, take a look at the maker movement. This is where innovation and creativity are coming back. What the maker movement is about is taking the tools that were created for industry back in the 1980’s and bringing the machines’ costs down to the point that any garage can be a factory. The implications of this are just starting to make their impact felt. The maker movement started more or less about ten years ago or so at MIT in the Center for Bits to Atoms on the East coast and with Make Magazine and it’s Maker Faires on the West coast. If somebody is looking for the future of innovation, try a Maker Faire. One thing is that the Maker movement is funding in ways that are as creative as making itself. Makers are using things like crowdfunding to avoid dealing with the onerous requirements of institutional finance. This works out well most of the time, but the system still has bugs. Makers are also bootstrapping their businesses but that inhibits growth in the short run. If this is any indication, the future looks bright. Kids are doing inventive things with better tools that are getting cheaper and more available all the time. Where this is goin to lead is up in the air, but I hope that things can go forward rather than back. Innovation and invention are not a constant process with a goal a the end. Innovations come in pulses in small communities that share ideas and information. If you take a good look at the various ways in which technologies grew it’s not hard to find these communities. You can see them for steam engines in the 1800’s, machine tools in the 1830’s in Britain and America, railroads in the 1820’s, bicycle in the 1890’s and automobiles around the turn of the last century. In the beginning they were tied to a locality, but as the 19th Century progressed and communications improved the communities were tied by information as well the typical small group of connected people. Silicon Valley was no different. In all these cases you see a pulse of rapid development followed by a long period of technology maturation. That doesn’t mean that innovation was dead, just that the low hanging ideas were used up and new basic technologies from outside and a new generation that will come along and have fresh ideas. Innovation never goes away. It is responsive though to risk and reward. If innovation seems to have stopped the thing to do is look and see how fertile the ground is for innovation. How heavy are the regulations, how high the taxes, how much does money cost? The US was able to create it’s prosperity because the ground here was very fertile indeed. Unfortunately the people in charge forgot, or never learned how the prosperity we enjoy came about in the first place. In their greed and ignorance the people in charge are in the process of salting all the ground with all their rent seeking and taxes with consequences that have yet to be fully felt. Innovation never stops, but it tends to follow the places where information is shared, invention is free of constraints and money can be made and used to create the greatest growth. This is how nations prosper. Also, one of the parties has worked hard. with an assist from some on the other. to ensure more and more people are less useful basic educations. All too many folks have no grasp of what was once included in a basic education. Some are not stupid, they just been in schools that teach less and less at ever higher cost. A cursory glance at the OWS movement and it’s “educated” leaders shows the folly of the “free” higher education as well. One whiner complaining about not being able to pay his student loans off, was unable to get a job even though he had a degree . . . in puppetry. None of this has a quick fix. Worse, one side of the political situation actively needs such a situation to maintain their power base. Got caught up in your “History Of Television” movie. Watched others like radio. Know some but my boss knows lots more. Mostly from a General Electric perspective. Longer than I like to reblog but well worth it.